The media, both mainstream and the ever-effervescent blogosphere, is alight with claims and counter-claims about what Pope Francis really meant. 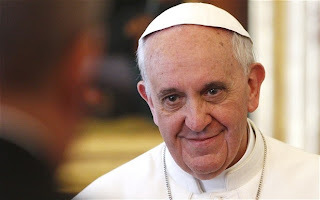 In an unusual move, he wrote an open letter last week to Eugenio Scalfari, the atheist founder of Italian newspaper La Repubblica, after the latter had published questions to the Holy Father regarding the latest encyclical letter, Lumen Fidei. Scalfari had asked what the Church believes about salvation for those who profess not to believe. Responses to the Pope’s ensuing statement have been all over the map. In England, The Independent made the headline: “Pope Francis assures atheists: You don’t have to believe in God to go to heaven.” Many in the Catholic press professed confusion and decried the Pope’s lack of tact and precision. Many Protestants picked this up as evidence that Catholic theology no longer follows scripture, or unnecessarily complicates what scripture makes clear, such as Hebrews 11:6. First of all, you ask me if the God of Christians forgives one who doesn’t believe and doesn’t seek the faith. Premise that – and it’s the fundamental thing – the mercy of God has no limits if one turns to him with a sincere and contrite heart; the question for one who doesn’t believe in God lies in obeying one’s conscience. Sin, also for those who don’t have faith, exists when one goes against one’s conscience. To listen to and to obey it means, in fact, to decide in face of what is perceived as good or evil. And on this decision pivots the goodness or malice of our action. The Pope’s words are clear. The confusion seems to rest on how we understand or misunderstand “conscience”. Let’s note the following about the paragraph above. The Pope’s statement is tactful. Regarding salvation, it actually says nothing. That is because it is never, ever, our position to say who will be saved. Salvation (or its opposite) is God’s domain. The Pope repeats what we do know about God: he forgives and is merciful. He extends this offer of forgiveness and mercy to everyone who turn to him with contrition. There is nothing new or scandalous here. Let’s zero in on the keyword, then: conscience. Even the atheists have one, so what is it? The Catholic catechism defines conscience as “a judgment of reason whereby the human person recognizes the moral quality of a concrete act that he is going to perform, is in the process of performing, or has already completed” (CCC 1778). It’s a judgment of reason, which all humans have to varying degrees. Conscience does not mean, therefore, “doing whatever we want”. In fact, it is the recognition of an objective quality of an action and an imperative to follow it. The catechism goes on to say: “In all he says and does, man is obliged to follow faithfully what he knows to be just and right. It is by the judgment of his conscience that man perceives and recognizes the prescriptions of the divine law.” This claims we are capable of recognizing God’s law, a law that is written on the human heart. Of course, a conscience must be formed; “the education of conscience is a life-long task” and “in the formation of conscience the Word of God is the light for our path.” (1784). All this has had to do with conscience as a guide to right action, moral conscience. But what about those who have not heard the Word of God or for whom it has been distorted? What about the consciences of those who do not believe in God? Whatever good or truth is found amongst them is looked upon by the Church as a preparation for the Gospel. She knows that it is given by Him who enlightens all men so that they may finally have life (LG 16). Like Pope Francis, the Council did not specify whether or not certain people will be saved – only that there is “good or truth” given people by Christ, that may prepare them for the fullness of Truth. In short, Pope Francis did not say that atheists can go to heaven without having faith in God. He also did not say that we save ourselves by our own efforts. This attests to the most basic truth – that we all need the mercy of God. The subtext of his letter to Scalfari was an invitation to faith. The very fact that Scalfari asked the question in the first place indicated openness to faith; why else would an atheist ask about salvation? The Pope sensed an openness to dialogue, and took him up on it. It’s a model that we in the secular West would do well to follow. So glad you addressed this, John. I loved what our pope said too, from the get-go. It seems people (and the media) have really poor reading comprehension, maybe? I love that Pope Francis takes the truths in the Catechism, and speaks plainly, in a language that (one would hope)the common Catholic or non-Catholic can understand. I also love the image of an atheist (during his life) meeting Jesus at the hour of his death, and running to Him in love and sorrow for his former unbelief, as a little child does when they are so sorry for something they've done.